Hakusan, Japan, November 17, 2017 – EIZO Corporation (TSE: 6737) announced that it has received FDA 510(k) clearance for breast tomosynthesis and digital mammography from the U.S. Food and Drug Administration for its 5 megapixel color medical monitor, the RadiForce RX560. Breast cancer screenings increasingly combine the use of mammography and ultrasound to view patients with high breast density. Furthermore, if breast cancer is suspected, various other tests may also be needed such as biopsy, breast MRI and CT. Because of this monitors that can accurately display tomosynthesis, mammography and general radiology are becoming increasingly important. The RX560 is the world's first medical monitor to use a low temperature polysilicon (LTPS) liquid crystal display. Because of this, the color monitor can reach a brightness of up to 1100 cd/m2, similar to that of monochrome monitors. In order to detect the smallest structures within breast tissue, the monitor offers a high contrast ratio of 1500:1. Furthermore the monitor has a response time of 12 milliseconds, making it ideal for enlarging and panning medical images, as well as quickly displaying 3D breast tomosynthesis which comprises of several images in each shot. The 5 megapixel (2048 x 2560) resolution is ideal for viewing the fine details in breast images. The RX560 is able to display both monochrome and color medical images on the same screen due to the Hybrid Gamma PXL function included with the monitor. With this function, both monochrome and color images are set to the optimum grayscale and gamma curve pixel-by-pixel, improving the efficiency of interpretation work. With these features the RadiForce RX560 has received FDA 510(k) clearance in tomosynthesis, mammography, and general radiography, making it ideal for all breast imaging types. 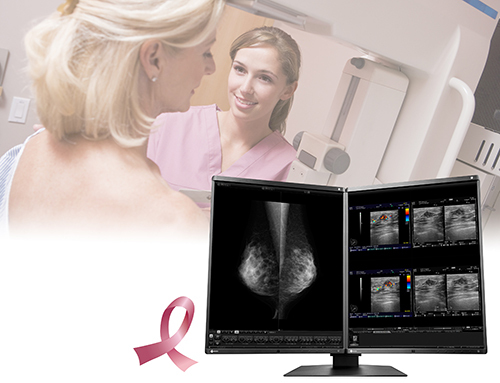 In this way EIZO continues to provide a high degree of customer assurance to medical breast screening professionals and their patients. EIZO will demonstrate the RadiForce RX560 at Booth 4100 in South Hall A at the 103rd Radiological Society of North America (RSNA 2017) from November 26 to 30 at McCormick Place in Chicago, Illinois (USA).